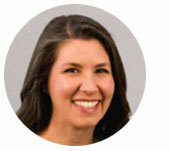 Kit is a youth services librarian at An Open Book Foundation and a regular volunteer at the Library of Congress Young Readers Center. An avid hiker and backpacker, she always has a book in tow and reads every night before bedtime, even by headlamp in a sleeping bag. Nothing says bedtime like sharing a good story, but who says we have to take the “bed” part so seriously? The Washington, DC region offers evening and overnight adventures for kids of all ages, so start with a book and let it lead you to some end-of-summer fun in the great outdoors! 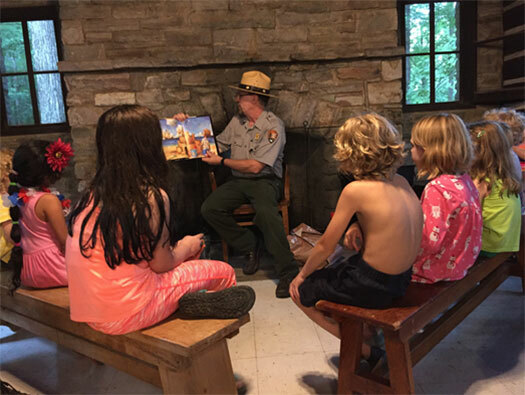 Regional Park Rangers and naturalists offer free and low-cost evening programs that include storytime and, often, hands-on interactions that heighten your child’s reading experience. Check out a few books on Bugs, Birds, and Animals, then encourage your child to try her hand at writing poems about them — like those in the lovely picture book Cricket in the Thicket, by Carol Murray and Melissa Sweet, or former U.S. Children’s Poet Laureate J. Patrick Lewis’s Face Bug. Once the sun sets, you can listen together for your favorite critters or let a naturalist help guide young ears during a Night Insects Campfire. Share a few books about diurnal versus nocturnal animals, like Wendell Minor’s Daylight Starlight Wildlife and William Low’s Daytime Nighttime, and then encourage your child to test out their night vision on a Nocturnal Senses Night Hike. Both programs and others (like Bat Fest!) are offered at Arlington County’s Long Branch Nature Center throughout the year. Is your reader ready to extend an evening outing into an overnight? Beloved friends like Curious George, Flat Stanley, Amelia Bedelia, and Olivia can help prepare your early reader to make the most of an introductory camping trip. Elementary-aged children will appreciate the multigenerational mishaps of Tamera Will Wissinger’s Gone Camping: A Novel in Verse or Lenore Look’s ever-reluctant second-grader Alvin Ho: Allergic to Camping, Hiking, and Other Natural Disasters. And, while no one would wish upon them the necessary survival efforts in Gary Paulson’s Hatchet or Jean Craighead George’s Julie of the Wolves, middle grade readers revel in the intensity of such modern and enduring wilderness classics. Have a teen who is a little more Wild than Walden? Offer YA titles like Wendelin Van Draanen’s Wild Bird, or the forthcoming Feral Youth, by Shaun David Hutchinson et al. If tents put you a little too close to nature for your taste, consider camping at one of several sheltered sites in the area. 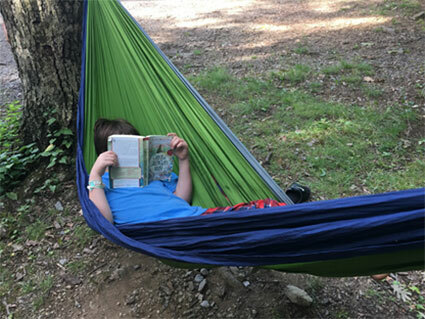 The Treehouse Camp offers easy proximity to Harper’s Ferry and the Appalachian Trail; cabins or cottages are available within three Northern Virginia Regional Parks; and you can even reserve a lockhouse along the C&O Canal to transport your young reader back in time. Share Patricia MacLaughlan’s Sarah, Plain and Tall by lantern light and imagine prairie life, or settle in for the evening as early Virginia Colonists did in Elisa Carbone’s Blood on the River. Visit the WPA-constructed cabins at Camp Misty Mount in the Catoctin Mountains during the summer months and, if you’re lucky, the National Park Service’s seasonal Park Ranger Dwight James (an elementary school teacher the rest of the year) will handle storytime for you, reading aloud a few picture books after an architectural introduction to the historical Dining Hall. For a greater appreciation of our protected parklands, bring along The Camping Trip That Changed America: Theodore Roosevelt, John Muir, and Our National Parks, by Barbara Rosenstock. Not ready for night time in the woods? No problem! Set the mood with a simple picnic dinner or, if you’re feeling ambitious, let everyone roast their own hot dogs over a campfire or grill. You’ll respect the efforts of an al fresco meal even more after reading Annette Bay Pimental’s Mountain Chef! Grills and picnic tables can be reserved at any number of local recreation areas including Rock Creek Park, Burke Lake, and Anacostia Park, among others. On the trip over, appreciate the urban beauty as does the child in JonArno Lawson’s Sidewalk Flowers and, as the sun sets, poke a few holes in the lid of a Mason jar and catch fireflies to study while you marvel at the exceptional photographs and sparse poetry of Helen Frost’s Among a Thousand Fireflies. If an afternoon shower scuttles your plans, move indoors and use April Pulley Sayre’s Raindrops Roll as the inspiration for an up-close examination of the water cycle at work. Build a fort using a table and a few sheets then, after dinner, you can retreat to your “tent” to share stories there by flashlight. Before bedtime, step outside to marvel at the darkened sky with Mordicai Gerstein’s The Night World. The fun doesn’t have to end with Labor Day. Did you know that all fourth graders (and their families!) enjoy free access for a year to National Parks and other fee areas? The online application for Every Kid in a Park is quick and can be done for individual children or by teachers on behalf of their classrooms. For a big city, Washington DC offers abundant opportunities to escape to the outdoors year round with a good book in hand. Happy reading, wherever you do it! Summer reading is more relaxing in the great outdoors.